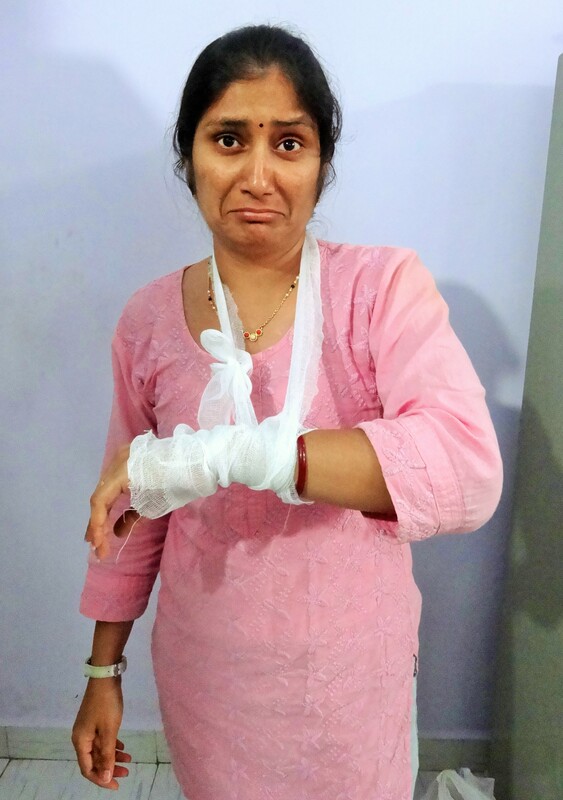 Dr. Madhavi: Immobilize the arm with a sling. Encourage the patient to hold the affected arm in the position that is most comfortable. Slip one end of an ace bandage under the arm and over the shoulder of the patient. Next, bring the other end of the bandage over the other shoulder, cradling the hurt arm. Finally, tie the ends of the bandage behind the neck. 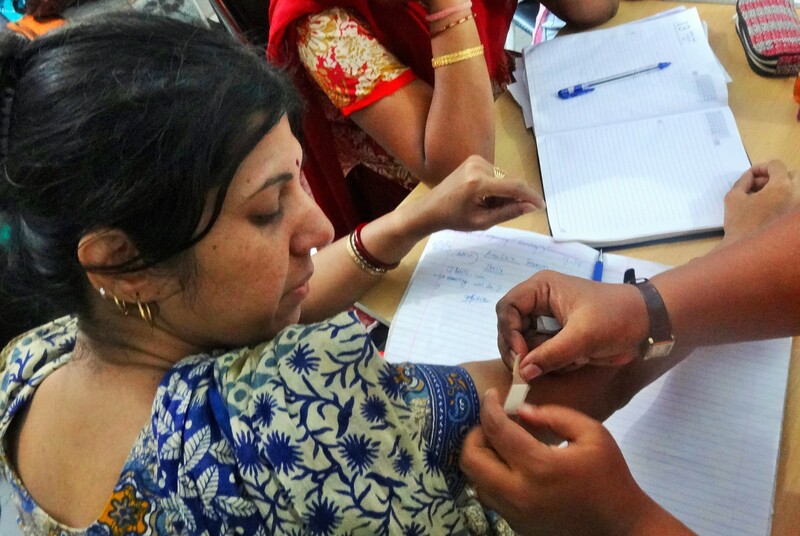 Fasten the edge of the bandage, near the elbow, with a safety pin. When finished, it is important to check that the circulation to the hand has not been compromised. Ms. Vaishali was returning pencils into the cabinet when one of the students came to ask a question. 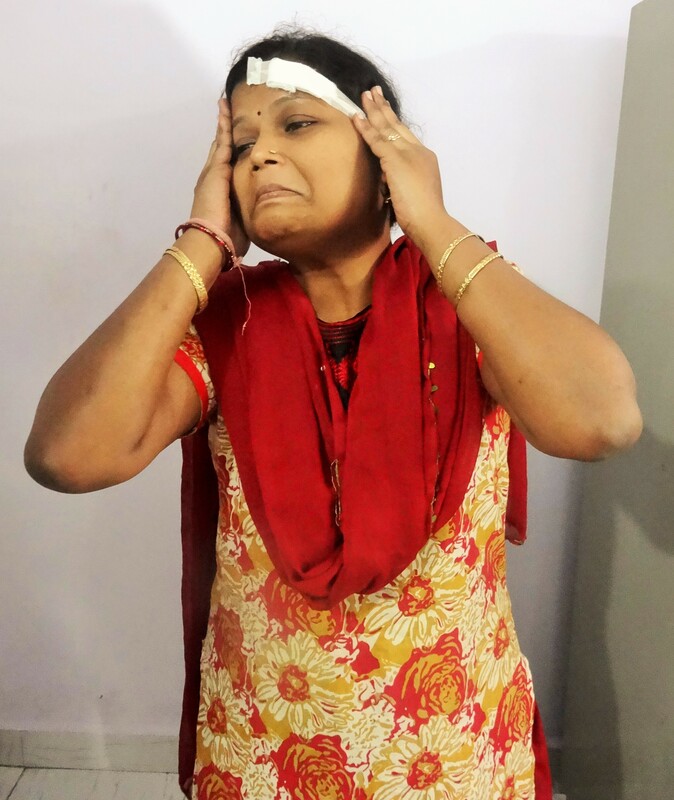 Forgetting she had left the cabinet door open, Ms. Vaishali stood back up and hit her head causing her to bleed. 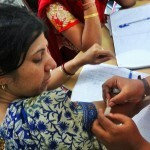 Dr. Madhavi: Clean and dress the wound. After stabilizing the head and neck, firmly press clean cloth to help stop any bleeding. Then, using antiseptic ointment, clean the wound and the area surrounding it. After drying the area, wrap clean cloth inside of sterile gauze dressing roughly the same size and shape of the wound and apply to the injury by taping completely. 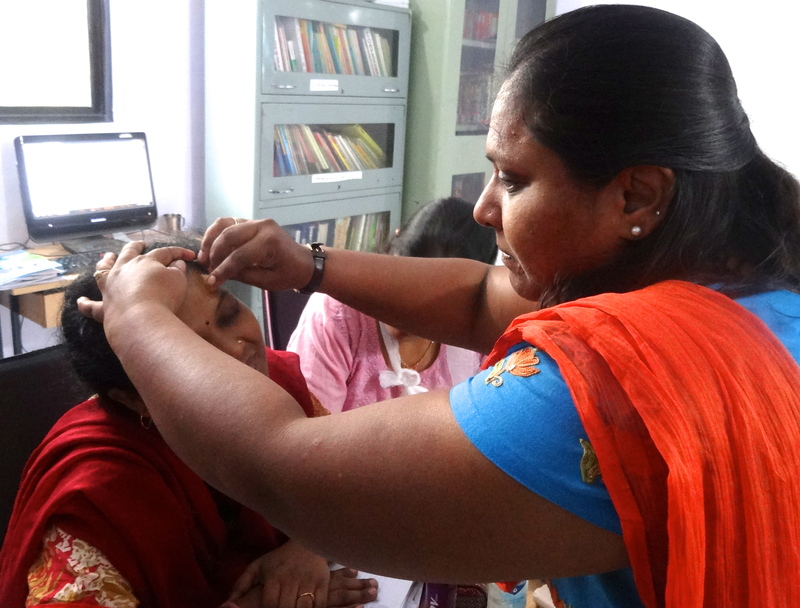 Ms. Barnali was eagerly grading assignments when she noticed that her arm was causing her some discomfort. Turned out, it was the cut she had gotten a few days earlier. 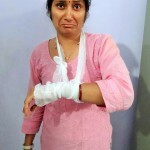 Dr. Madhavi: Apply a bandage. When dealing with a wound that has reopened, it is best to clean the area with antiseptic cream, keeping the cut hydrated and then applying a bandage. 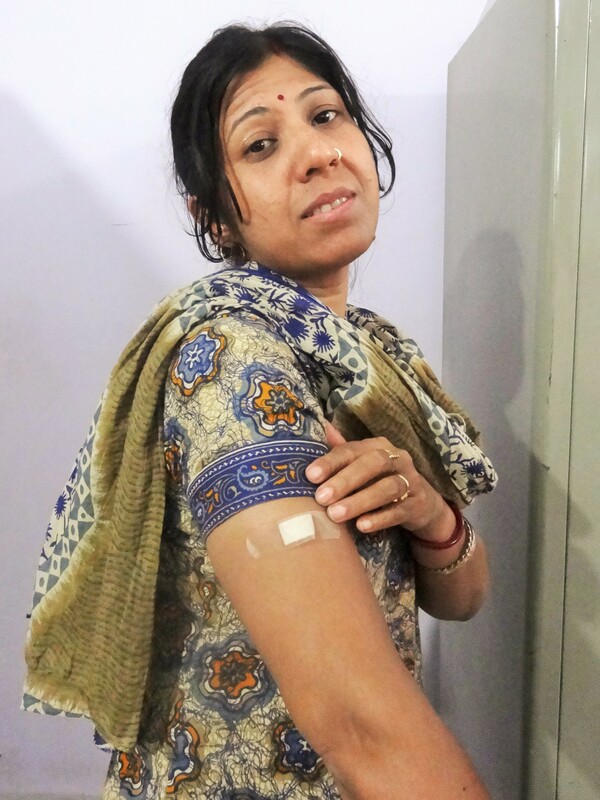 Dr. Madhavi suggests making sure the bandage does not completely cover the cut to allow the laceration to breathe and not get stuck to the dressing. 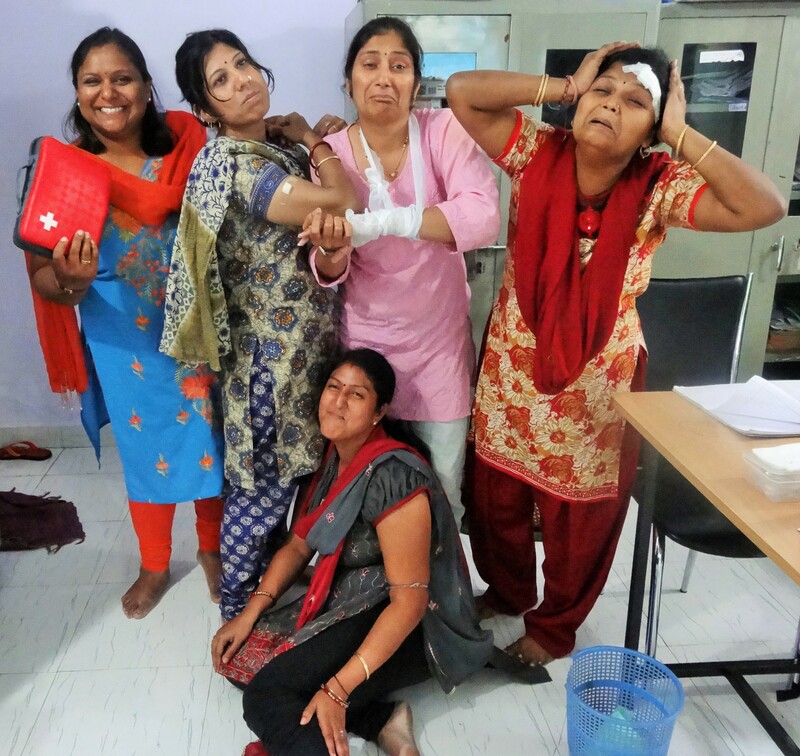 While Ms. Shampa was choreographing an alphabet song for her pre-primary students, she got a little carried away, twisted her ankle and fell! Although she was giggling at first, she felt some pain and realized that she might have sprained her ankle. 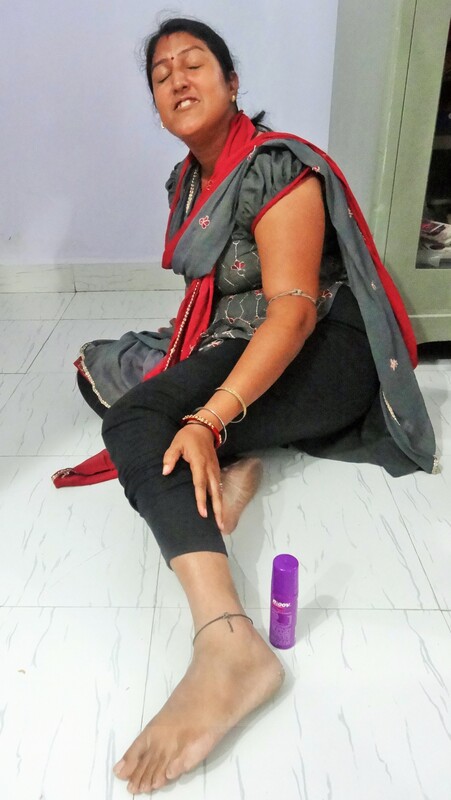 Dr. Madhavi: Use icepacks, a bandage and raise the ankle. The very initial step would be to make sure the patient stops all activity and rests the injured area. Use pain reliever, such as Moov spray to help ease discomfort. Firmly bandage joint and apply icepacks for 15 minutes every 2 hours. When possible, raise the ankle above the height of the patient’s heart. Congratulations! You have completed Dr. Madhavi’s first aid workshop. Although it was lighthearted and fun, we do want to assure you that safety is taken very seriously at AIC. All of the nursery school staff are now equipped with the knowledge to help administer basic first aid to a child in need. We hope you are too!